Workers of state owned enterprises such as Ports Terminal Limited have been urged not to be used as pawns by political parties as the nation heads towards September 17. 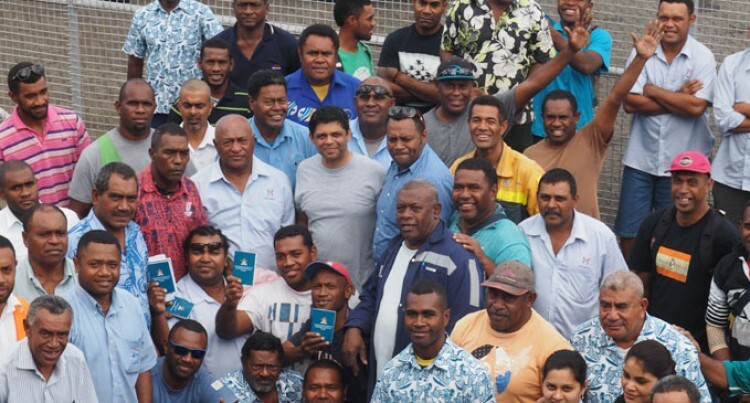 FijiFirst Party general secretary Aiyaz Sayed-Khaiyum addressed dock workers after the union invited him to talk about the Party yesterday. Speaking at the port, Mr Sayed-Khaiyum told the workers who had ended their shift for the day or were starting new shift what the FijiFirst movement meant for them and for the nation. While talking on a whole range of issues such as false information and lies that continues to be “spread by SODELPA and the National Federation Party”, Mr Sayed-Khaiyum also explained that there needed to for a collaborative approach between employers, employees and Government and not the antagonistic and aggressive style of trade unionism displayed by a handful of individuals. Mr Sayed-Khaiyum discussed with the dock workers how some trade unionists had used ordinary workers to further their own agendas and fill their own pockets. He said that these trade unionists did not care about the survival or the well being of the very company, including the state owned enterprises, where their very members work at. This, Mr Sayed-Khaiyum explained, was not a very good foundation to build viable state owned enterprises and the economy. He also discussed with the workers that while wage increases were part of employment, it was not the only way to meet the cost of living. He discussed with them that the Bainimarama-Government has helped those at the lower end of socio-economic scale to meet day to day expenses a lot more easily through such initiatives as free education, subsidised bus fare schemes, free text books, new pension scheme, controlling the price of basic food items, continuing with zero VAT on certain food items and medicines. Misguided questions such as whether putting land in Land Bank meant the land owning units would lose their land were also asked by the workers. Mr Sayed-Khaiyum explained that this was far from the truth and that land owning units who out their land into the Land Bank did it with the consent of more than 60 per cent of the members and that unlike iTaukei Land Trust Board, no poundage was charged by the Land Bank.